← Crisis – what crisis? We all get older. Even Iain Rice gets older. That young whipper-snapper with radical ideas on P4 modelling and on layout design is now an elder statesman of the hobby. Fortunately he writes in just the same style as he ever did – and this makes his books a joy to read even about the more boring bits of modelling – but perhaps with a modicum more experience. His latest book explores the world of cameo layouts. You may first note the price – a significant £24.95. It seems expensive, but all books are these days. And it is still less than a new Farish coach, and probably a lot more useful. It is this sense of something that encapsulates a subject concisely and within a complementary setting that I seek to apply the term ‘cameo’ to a model railway. That is, a representation which conveys the nature and character of a prototype in a small space while being executed to a high standard, the modelling being set off by a visually pleasing presentation. To which aesthetic criteria I have added the practical ones that the whole thing should be structurally and functionally self-contained, easy to move and store, and readily adaptable to different circumstances. Perhaps we might define it as a small layout, perhaps up to 8′ in length, of a small piece of prototype railway. This may well be a branch line terminus, or a light railway, but could equally be industrial, urban, or part of a goods yard or loco depot. It will probably be foldable and easily transported to shows. And it may well be operated from the front, have an integral backscene and ‘proscenium arch’ to frame the layout, and an integral fiddle yard and electrics. 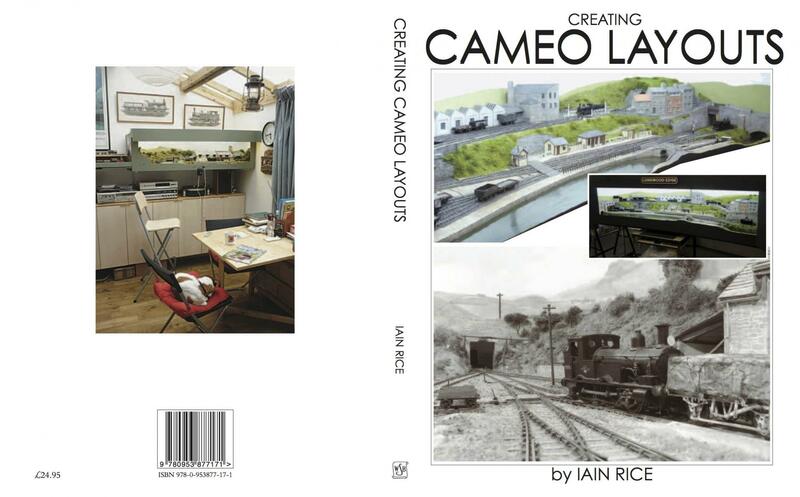 The covers of the book illustrate the idea from Rice’s own layouts – front and back cover show Trerice, ‘P4′ china clay in 6’ plus a fiddle yard. And the front cover has the two level LNWR and L&YR urban layout ‘ Longwood Edge’. Here’s a short video of Trerice. And this is a typical Rice small layout – originally as a three level, ‘stacked’ design where you used the cassette to move from one level, and station, to another. But it would make an interesting small goods exchange station in its own right. The book is full of good advice and techniques for design, baseboards, through to couplings and operation. Indeed, the section on couplings is most worthwhile, although it is aimed at 4mm scale, as it carefully compares a range of different couplers. At the end of the book, there are a number of worked examples of ‘cameo’ layouts. All of interest, though my one criticism of the book is that these examples only includes one ‘urban’ one, and none from East London, where I feel some of Rice’s best designs originate. Again, another recommended purchase to add to your armchair modelling books. This blog (and the next few) come from Singapore. I’m lucky enough to be here for 10 days – though I will be working for the weekdays and trying to finish other projects over the weekend. No chance of trainspotting, though….